Never mind what typical agents tell you. Never mind what you read in the papers. Auctions are a stressful, financial minefield for consumers. Despite the booms we've had in many areas, there are still thousands of sellers who don't realise, until it's too late, what really happens to them at auction. The reserve price is the lowest price a seller is prepared to accept, after 6 weeks of intense torture and conditioning. And that becomes the central focus of the auction. If you are trying to get the highest price, do NOT choose an agent that’s focused on your lowest price. There are two parties in a sale price negotiation: a seller and a buyer. Each has their “final price” or their “limit”. The seller's final price is the reserve – that’s the lowest the home will sell for. The buyer's final price may never be known. There is no procedure at an auction for determining the highest price a buyer will pay. Only the highest price of the losing buyers may be known because they stop bidding once they reach their limit. But the buyer who is the highest bidder often buys at less than their limit. Most buyers at auction buy for less than their limit, which means most sellers at auction under-sell their homes. You can’t possibly get the highest price for your home if the central focus is on the Seller's Lowest Price. You can only get the highest price if the focus is on the Buyer's Highest Price. As a seller, you are at a huge disadvantage because your lowest price (the ‘reserve’) is always disclosed BEFORE the home is sold. That’s when you hear the agent yell, “It’s ON the market”. Everyone knows your lowest price. Not so with the buyers. If their final price is ever disclosed, it will be AFTER the sale is over. By then it is too late for the sellers. It seems as if the price goes up at auctions. But that’s only because they start so damn low. It’s like starting the day with a massive hangover and saying that you are going to feel better as the day progresses. That’s not a good reason to get drunk every night. Your sale must start from a good position... a position of strength, not of weakness. "The Number One Principle of Negotiation is to ALWAYS START HIGH!" Research shows that more than 90% of buyers do NOT like auctions. It makes no sense to use a system of selling disliked by most of the buyers in the market place. You can only get the highest price if all the buyers who may be interested in a home are given the chance to buy the home. As auctions repel so many buyers, it is highly likely the highest paying buyer will not be there. It is a well-known fact that investors, property dealers and bargain hunters all use auctions to find cheap deals in real estate. Often the best deals are bought for a song after the auction has failed. Property investors, developers and dealers often buy at auction... But they almost NEVER sell at auction. But that’s because their focus is on a quick sale, not the highest price. The sale is more important than the price the property sells for. The banks and the Government departments are not the owners in the way that consumers are owners. If two or more people want to buy the same home, the worst thing you can do, from a negotiation point, is to allow each person to see what the other is offering! If one buyer is prepared to pay $1,000,000 and the under bidder is only prepared to pay $895,000, it is mathematically impossible that a public auction will attain the best price. In this case the property is most likely to sell for around $900,000. You just cost yourself $100,000. You feel let down by the market, but in reality the selling process failed the owner. An auction will determine what the Highest Bid is, but what about the Highest Price! Highest Price or Highest Bid. Do you know the difference? If you have the fortunate situation of having more than one buyer trying to buy your home, the worst thing you could do is disclose the competing offers to each of the interested buyers. Instead of offering their highest price, each buyer will focus on offering one bid more than what the other buyer offered. Auctions are touted as being competitive – but the competition is public, not private – which makes it COMPARATIVE more than competitive. Everyone compares what everyone else is offering. By having a public negotiation, the buyers have a tremendous advantage over the seller. Instead of having to offer their highest price to win the auction, buyers only have to outbid the buyer below them. In such circumstances, the respective buyers' focus becomes outbidding the competing buyers by $1000, as opposed to offering their highest price for the property. When you are selling your home, you want the eventual buyer to have paid their maximum price for it. To win an auction, the buyer does not need to pay their maximum price, they just need to be the highest bidder. There is a big difference and that difference could mean tens of thousands to you. Home sellers are often told that the auction deadline pressures the buyers. As the auction deadline draws closer, the pressure is often transferred onto the seller to come down in price. Agents call it “meeting the market” or “conditioning”. It is extremely common for a property to be passed in at auction and then sell for a higher price after the auction during a private negotiated process. Even so it greatly damages the price of your home. Any chance of a high price is destroyed when your home passes in for a low price at the auction, in front of a big crowd and then that failure is advertised in the papers and all over the internet. 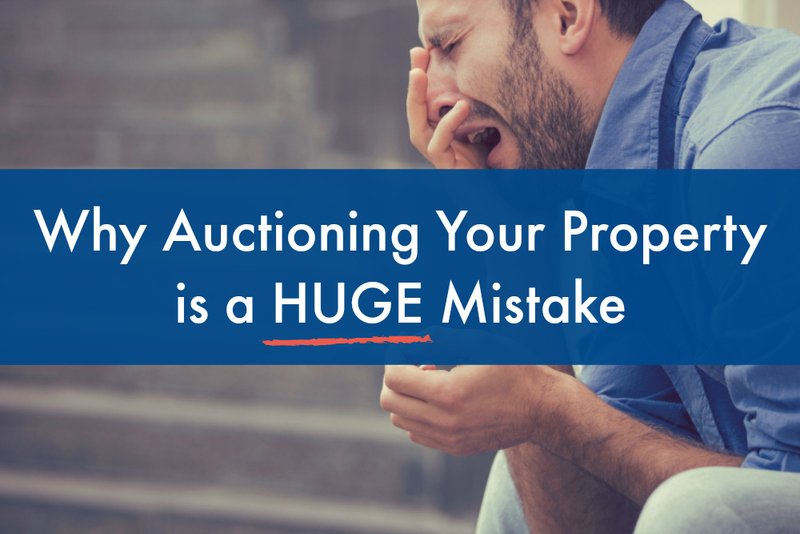 Buyers will wonder what is wrong with your home when it fails at auction. The home is often not the problem; the selling process failed the owner. To persuade sellers to auction their homes, agents will talk about dream prices. And then to get buyers to come to the auction, the same agents will talk about a bargain. Most times both sellers and buyers are deceived. The sellers end up selling for less than they were told they could get, and the buyers often end up paying more than they were told they could pay. So how do you get a great price if there is only one buyer? The most infamous deceit is Vendor Bidding, where agents use bogus bids to keep the auction moving. Some agents deny that Vendor Bidding exists. But consider this: How do you have an auction with only ONE bidder? Most people think Vendor Bidding increases the price. But Vendor Bidding deceives sellers as much as buyers. It is used to get the price up to the point where it can be sold – the reserve price. Usually, once the home reaches its reserve, the agent stops using bogus bids. The home is then sold for its lowest price. Quoting $750,000 plus when the seller wants $950,000 is supposed to attract buyers. And indeed it does. But it attracts the wrong buyers who want to buy at the low price NOT at the price the seller wants. Many of these buyers can’t afford to pay much more than the price advertised. And so, on the day of the auction, there will be a crowd of buyers all wanting to buy at a low price. The agent will then say to the sellers, “This is what the market is telling us.” But the agent has been looking in the WRONG market. Anyone who has studied negotiation understands the principle of power. In an auction, the seller has the perceived power all the way up to when a home does not sell at auction. Every week thousands don’t. At this point there is a huge power shift to the buyer. You are now labelled a “lemon or failure”. Buyers think something is wrong with it and there are no other buyers, they are often right. All buyers will offer lower than they may have otherwise done, and let's face it, why wouldn’t they? These are just some of the reasons why I believe AUCTIONS are the worst way to sell your property. I hope it’s enough to make you think carefully when someone wants you to sign up for an auction. For more information please feel free to give me a call on 93795616.